Welcome to the UCC Filing System! This service allows you to submit new UCC filings, submit amendments to previous filings and search the Secretary of State UCC System for filings and amendments. You must be an INA subscriber to take advantage of this service. Electronic debits against your checking account is the accepted method of payment for the UCC Filing system. You will be asked to provide this information when you sign up for the service. For more information about the system, please read the FAQ or click Technical Assistance. 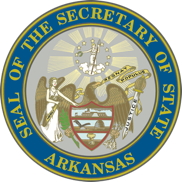 Use these links to find general information about the UCC Division or to find out about other Secretary of State services on the Arkansas Secretary of State Home Page. Should you need the entire UCC filings database, you may purchase a full data download through the INA FTP site. You must be an INA subscriber to access this service. For additional information please click Technical Assistance. Our Frequently Asked Question section will provide you with helpful information about the UCC Filing System. If your question is not found, submit your own and our technical support will contact you with the answer. NOTICE: Act 942 of 2009, effective December 31, 2009, changes the filing office for most UCC -agricultural related filings to the Secretary of State.